Can wireless electricity kill people? Probably not. Even when it's nipping at our toes, wireless electricity is pretty safe. In 1899, Serbian engineer Nikola Tesla built a 142-foot-tall, 12-million-volt electric coil in Colorado Springs and transmitted electricity wirelessly across 25 miles, illuminating 200 lamps with the charge. After he flipped the switch, flashes of lightning leaped from the coil, but no one was harmed. 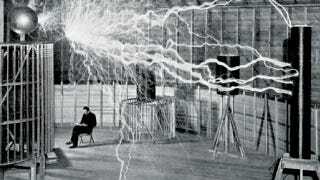 Tesla's experiment proved that the Earth itself could be used to conduct electricity, no wires necessary. He also experimented with electromagnetic induction, a phenomenon discovered 70 years before Tesla's experiments by the English scientist Michael Faraday. In electromagnetic induction, an oscillating magnetic field around an electromagnet produces a current in a nearby conductor-in effect, the current jumps the gap. While it is airborne, electric energy exists as a magnetic field. Magnetic induction is used today in the contact plates on electric toothbrushes, transmitting a charge from the plastic-wrapped charging station to the battery inside the brush. In 2006, Marin Soljacic, a physics professor at the Massachusetts Institute of Technology, sent wireless electricity across a room to light a 60-watt bulb. Soljacic used electromagnetic induction, but with a twist. By tuning the sending and receiving coils in his electromagnetic field to resonate at the same frequency and engage only at that frequency (the way glass will shatter when struck by sound waves of just the right pitch), the current is focused and bypasses everything else, humans included. Resonant coupling, as Soljacic's process is known, is far more efficient than Tesla's attempts, and safer too. Soljacic has a company called WiTricity, and he can now send 3,000 watts across a room-or a garage, since 3,000 watts can charge an electric car.